When it comes to quilt blocks, bigger can be better—and faster. 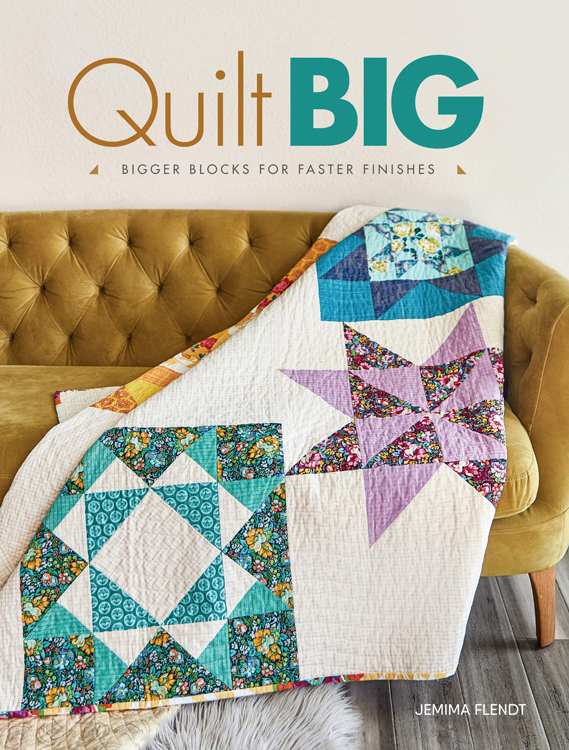 In Quilt Big, author Jemima Flendt shows you how to scale-up classic blocks—Log Cabin, Flying Geese, Indian Star, Home Treasure, and more—to create gorgeous quilts and home décor projects that show-case your favorite fabrics and large-scale prints. Step-by-step directions for 22 supersized blocks. 17 patchwork projects—from quilts and wall-hangings to pillows and a runner—for almost every room in your house. Expert advice on choosing and working with large-scale prints. So whether you’re new to quilting or simply looking to try something new, there’s no better way to supersize your skills than quilting on a grand scale. With Quilt Big, you can create bold, beautiful designs quickly and easily. So, go ahead and dream big.